If you're looking for a quiet place to get away from it all. Look no further. This property has all the amenities you're looking for and the seclusion you need. Relax in the tall pines and enjoy outdoor living at its best or take advantage of the area surrounding the Torreon communities. There is a playground for the kids, walking trails all along the golf course. This rental does NOT include the transferable GOLF membership or use of the POOL, Workout facility or indoor KIDs center. Fine dining and casual dining restaurants are available on property. Don't forget the winter sports! Show Low is about 30 minutes away from Sunrise Ski Resort. We purchased this home in 2011 because we LOVE Torreon and all it has to offer. We have a very busy family life and can only use this home a few weekends each month so we are opening it up for others to enjoy as much as we do! This property is located in the back of the development with virtually no traffic so it is great for families with small children or retired couples. 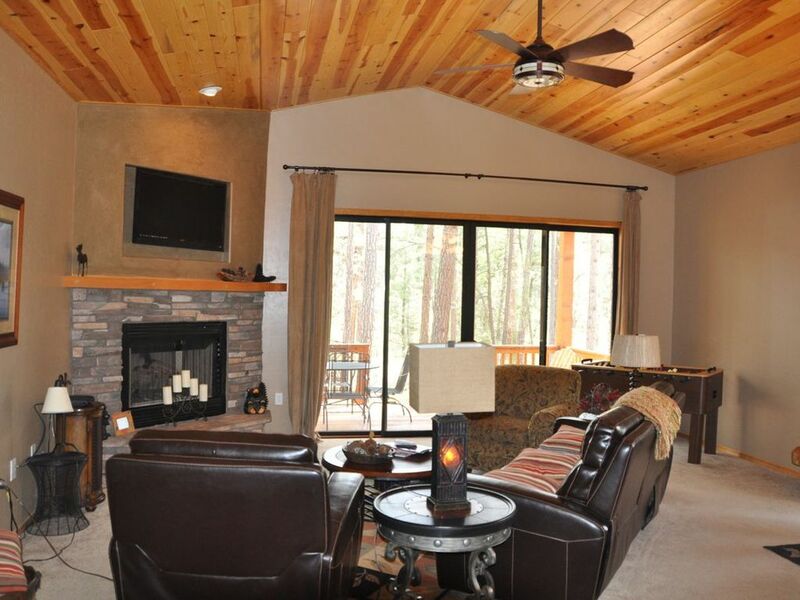 We have great views of the golf course from our front porch and views of the tall pines from the back porch. It is just a perfect setting for rest and relaxation. We have replaced all the linens and towels and the furnishings are in excellent condition. The family room has a foosball table and the backyard has horseshoe pit. The hall closet is stocked with board games to keep your family busy after a long day of golf or fishing at the lakes in the area outside of Torreon. You can see the golf course from the Front Deck. Mountain and Forrest Views are off the back and all around the house. 2 car garage and a nice driveway. Great dinning area that looks out on to the forest and surrounding area. There are two adult bikes as well as bikes for kids of all ages. Please treat them as if they were your own. Front and Back Deck. The front deck has nice views of the golf course. The deck on the back has great view of the tall pines. Sunrise Ski Resort is only 45 minutes to the top of the mountain. There are sleds in the garage. We are so happy you loved your stay and enjoyed your Holidays! This cabin was absolutely perfect for our weekend getaway! It was clean and had everything we needed! Deb was absolutely wonderful about getting us any information we needed and being available to us. Thank you so much for opening your cabin to us! Such a great experience. We had an excellent time at this cabin. We had plenty of beds for two families ( the double bunk room was awesome). The cabin was fully stocked with what we needed (crock pot, cooking utensils etc). It was also very clean. It backs up to the creek. We went in the winer so there was no running water, but can imagine that the kids would love the running creak at another time of year. Also, the golf course had a snow and we were able to just walk across the street and do some sledding with the kids (we had children under 12), but it was wesome. We will definitely will be back. My #1 requirement for any place I rent is that it is clean. This place was clean, quiet, and had everything we needed. We had a great getaway over Labor Day Weekend, and there is a lot to do and see at Torreon. My wife and two young daughters can't wait to come back. Owners were good communicators and answered all questions. We will definitely rent from them again. Our month in Keith's Torreon cabin was everything we hoped for and more. The cabin was elegantly furnished and equipped right down to the smallest detail. It was exactly what we expected from the pictures. The master suite is to die for and the other two bedrooms were very comfortable and worked very well for our family. Keith was very helpful during the pre-booking period and that carried over into our stay. The setting in the tall pines was very relaxing. We appreciated having access to the Torreon Club Restaurant. We can definitely recommend this cabin for short and long term stays. Thank you again for coming to our cabin. We really enjoyed our weekend getaway. This home had everything we needed. We enjoyed grilling our dinner every evening. We also enjoyed sitting on the back porch each morning with our coffee. The home was very comfortable with everything we could need. There were six of us (4 adults 2 kids). The bedrooms were very comfortable as well. The home is beautifully situated on a quiet street with tall pines surrounding it. We enjoyed walking the neighborhood as well as hiking nearby. Our only negative we had for our trip was that most of the dishes and silverware were dirty had to be washed first before using. Guests are expected to clean their own dishes and put away upon departure. That's fine but it is evident some didn't do this and put dirty dishes and silverware back in the cabinets. The owners probably are unaware of this. All in all we would definitely stay here again! We have already referred this home to several friends. Thank you so much for letting know about the dishes. We now have our cleaning crew double checking the silverware and the dishes.